You might not want to let your kids see the new shoes for Easter made by +Reebok. 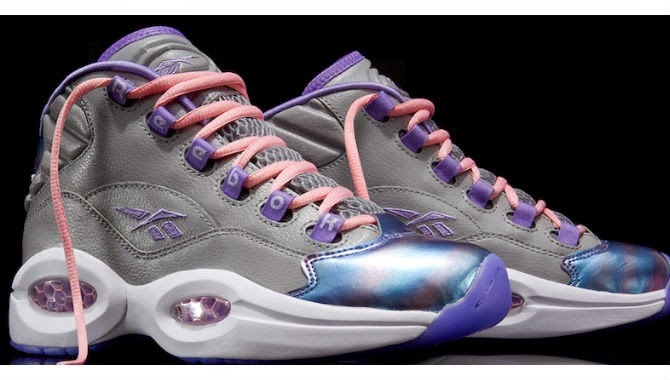 The sneaker made popular by former Philadelphia 76ers’ all-star Allen Iverson will feature a grey base with pops of pink and purple. The combination of pastels is themed after the Easter holiday and will be strictly made in kids sizes. No word yet, if these Reebok’s will be available in adult sizes. The Reebok Question Mid ‘Easter’ will be sure to hop off the shelves, head to Finish Line, Eastbay, Villa or Reebok.comon March 27 to pick up these kicks. Reebok Classic rejuvenates the kid’s Question Mid with the release of the Question Mid ‘Easter’ set to drop within the next few weeks.